We awoke this morning to blizzard-like conditions. It was snowing to beat the band, and the wind was howling. We checked out of the Sleep Inn in Johnstown, PA, made our way to Denny's for breakfast, and prepared our agenda for the day. We originally thought we would visit the Johnstown Flood Museum, not to be confused with the Johnstown Flood Memorial, which we visited yesterday. The Museum, though, turned out to be closed on Sunday. 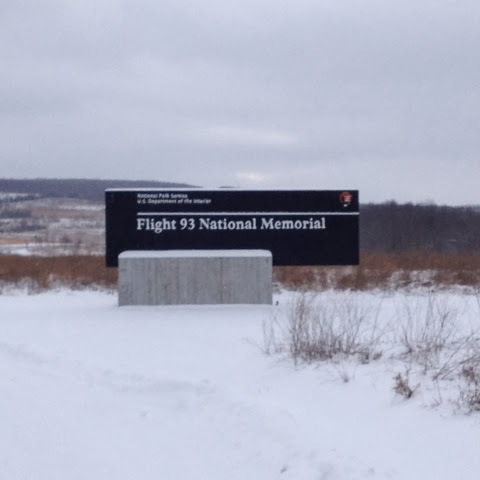 Plan B would be a visit to the Flight 93 Memorial, just down the road near Somerset. We stopped at Walmart for a few supplies, then headed south to the Lincoln Highway, and ten miles east to the memorial site. It's a sobering place, fitting right in with the rest of our "dark" weekend (Johnstown flood and dead Hollywood star Jimmy Stewart). 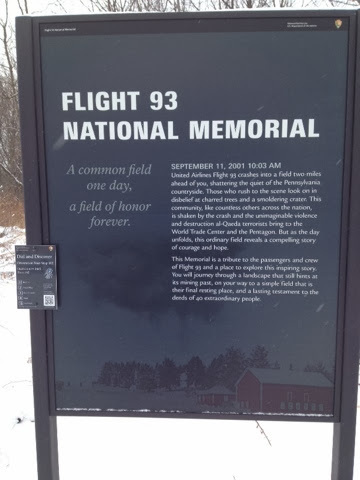 It's essentially a large field with a series of information boards containing information about what occurred on 9/11/2001, and in particular, the fate of Flight 93, which went down here after the passengers and crew decided to try to stop the terrorists who had hijacked the plane. The site looked like a frozen wasteland, with snow drifting all over the road, the wind blowing, and overcast skies. We got out and walked around, but it was intensely cold, and we made our visit a short one. The rest of our day, and our trip, was not really planned. We decided to go visit my aunt and cousin in Uniontown, PA, my father's hometown, about an hour or so west and completely out of our way, but we were in no hurry to end the trip quite yet. We ended up on a lot of back roads, which our GPS, "Michelle", seems to prefer, so though we were making good time, we had to be careful since the roads were not in the best of shape. In addition, there were plenty of people driving excessively slow on these roads. We finally arrived at my Aunt's place at around 2:30. She was happy to see us, and fed us lots of good, home-cooked goodies, like veggie soup and pepperoni rolls, plus peanut butter fudge. We felt bad about our short visit and eating up her food, but she claimed it was worth it to see us. Then we began the long trek home. Shortly after entering Maryland, just past Frostburg, the snow completely cleared out and we had smooth sailing all the way. We stopped in Hancock, the traditional halfway point of the trip from Uniontown to home, and had dinner at the old Park 'n' Dine restaurant, one of our favorites. My family has been stopping here since the 60s. Unfortunately, the food was not very good. I always get the hot turkey sandwich with mashed potatoes, dressing, and gravy on top of everything. The stuffing, though, looked like it had been sitting out all day, and the turkey was all dark meat. The fact that the restaurant would be closing about an hour after we arrived might have something to do with poor food, but I was disappointed. We continued down the road after eating, and we arrived home at around 9:30, tired and happy to be home. We're thankful the Lord gave us a wonderful trip, despite the questionable weather and not being able to do much of what we had planned to do, but the snow was awesome, and there is a bit of comfort associated with traveling in adverse weather. Don't ask me why. I was also very pleased with our new Jeep. It ran great, and the weather ended up being the best test for it. I was happy with how it handled, and I never felt worried or uncomfortable while driving it. It's a solid 4-wheel drive vehicle.